While Reggae music had its prominence in 70s Nigeria, it was highlife and Fela Kuti's afrobeat that gave the country its own musical national identity. Originally from Southern Nigeria's Benin City, Edire ''Pazy'' Etinagbedia and his band The Black Hippies released their second LP, Wa Ho Ha on EMI Nigeria in 1978 building on a body of work that effectively glides between these styles creating an incredibly unique record that has become a cult classic. 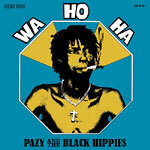 Wa Ho Ha features Pazy and his Black Hippies engaged in call and response vocal anthems all backed by incredibly deep rock steady grooves and afrobeat rhythms filled with funky horns and psychedelic guitar accents. Recorded in the legendary EMI Nigeria studios, Wa Ho Ha typifies the 70s Nigerian sound enthusiasts the world over have come to know and love, but puts an inimitable twist on it. This rare gem has been lovingly remastered and the original art work painstakingly restored. Used copies seldom appear on the market, and when they do, it's usually in small private circles and you could put yourself through a semester or two of community college for what it costs to obtain a beat-up copy. Available on CD and vinyl, Secret Stash is proud to partner with Comb & Razor to present the first ever reissue of this funky rarity. CD version comes in a premium digipak. Open copy, played in our store. Excellent condition. ''Promo'' written on the front cover.